OTAY MESA–San Diego Habitat Conservancy has taken over management of Otay Crossings Open Space Preserve. 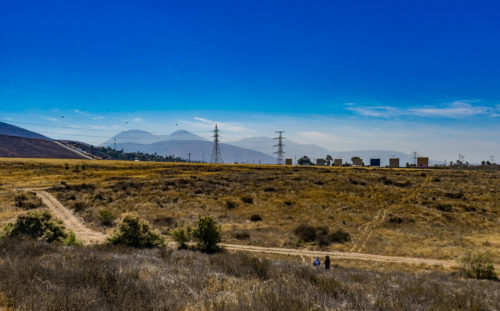 The preserve, located at the base of the San Ysidro Mountain foothills in the southeastern portion of Otay Mesa along the U.S./Mexico border, is a 25.1-acre preserve consists of three parcels which serve as onsite mitigation for the 311-acre Otay Crossings Commerce Park project currently under construction. The preserve provides much needed habitat for burrowing owl (Athene cunicularia). The burrowing owl is a small raptor whose numbers have dwindled over the years due to loss of habitat associated with urbanization as well as with eradication programs aimed at rodents which have incidentally poisoned countless burrowing owls. It also provides refuge for a number of other sensitive wildlife species, including two species of federally endangered fairy shrimp, the federally endangered Quino checkerspot butterfly (Euphyrdryas editha quino), and golden eagles (Aquila chyrsaetos), one of the largest and fastest raptors in North America. A number of rare plants are also being protected at the preserve, including Otay tarplant (Deinandra conjugens), California adolphia (Adolphia californica), and San Diego sunflower (Bahiopsis laciniata). The conservancy’s long-term management duties will include monthly site visits, surveys for rare wildlife and plant species, and removal of invasive plants. They also conserve and manage sensitive habitats and species while inspiring land stewardship through education and outreach. San Diego Habitat Conservancy was established in 2000 and currently manages 26 open space preserves throughout the San Diego region, for a total of nearly 1,800 acres. Their focus is to preserve and manage sensitive habitat and species that are unique to the southern California environment. The conservancy shares its knowledge and appreciation of the natural environment with the San Diego community, encouraging participation in the stewardship of the region’s open space.